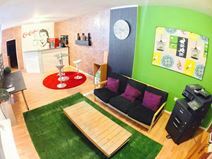 Not only is there collaborative space but there are also smaller spaces, such as the comfortable and cozy minibar (office) with coffee maker, refrigerator and microwave for a relaxed working environment. Access to the centre is available 24 hours a day, 365 days a year so you can build your business at any time. There are several bus stations and a tramcar station all within walking distance of the centre for your travel convenience. With a light and spacious feel this flexible co-working space provides a great work environment to cater for up to 17 people, along with a meeting room suitable for up to eight people. 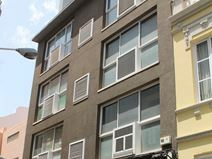 An ideal location in the heart of Santa Cruz de Tenerife surrounded by a range of local amenities. Just a 5 minute walk away, you will find a gym that will keep you motivated, as well as a sports complex just by El Besos.